Located in the heart of downtown Princeton at One Palmer Square (also known as 76 Nassau Street) Capable hands-on counsel. When you engage us, you can be confident that we will be performing the services ourselves, that we will be current on all aspects of your matter, and that we will always be available by phone or email to respond to your questions or concerns. The firm commits itself to providing the highest level of legal service in an efficient, responsive and individualized manner. We are two experienced and skilled, hardworking attorneys dedicated to serving the best interests of our clients. We work with you. We enjoy the challenge of working collaboratively with our clients to make planning decisions and solve or manage their problems. Allen Porter has a particular focus on estate planning and administration. He works with professional, academic and business people seeking proper guidance and planning advice. Jerry Muller concentrates in land use, including representation of boards and private clients, and also commercial litigation and mediation. We perform all legal services ourselves. Well-rated and highly qualified. Allen Porter and Gerald Muller are both AV Preeminent Peer Review Rated by Martindale-Hubbell, the highest recognition possible in the legal industry, for professionalism and ethics. Both partners have been recognized by Inside Jersey as among "New Jersey Top Legal Minds." 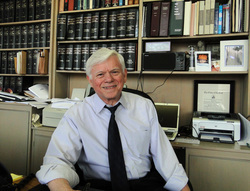 Jerry Muller graduated from Colgate University in 1966 and Yale University Law School in 1970 and, in addition to his private clients, serves as counsel for: West Windsor Township Planning Board (1993 - current) Millstone Borough Planning Board (2001 - current) Jerry Muller is also certified as a Divorce and Family Mediator by The New Jersey Association of Professional Mediators. Allen Porter graduated from Princeton University in 1963 and the University of Virginia Law School in 1966 and, and in addition to his private clients, serves as counsel for: Princeton Planning Board (1977 - current) Princeton Area Community Foundation (2005 - current) Allen Porter has been designated as a "Select Wealth Manager" by New Jersey Monthly for 2011 and 2012. Our practice We are licensed to practice throughout New Jersey, but the bulk of our practice is in the Princeton area, including nearby areas of Mercer, Middlesex and Somerset counties. We are dedicated to helping clients with their legal matters regarding: Estate Planning and Administration Land Use and Zoning, including litigation Civil litigation Mediation, including family law matters Business formation and planning Commercial and residential real estate Our estate planning work is geared to individuals who seek guidance in tax planning and in addressing their family or business law issues. Our clients often seek advice as to trust creation, tax management techniques and planned charitable giving. Our estate administration practice covers all sizes of estates for decedents who were domiciled in New Jersey at the time of their death or out-of-state decedents with property in New Jersey. We assist clients seeking representation with zoning and land use planning issues, except in those municipalities where our firm represents the local planning board. We can assist individual clients in defining their needs and seeking approvals from the appropriate boards and commissions. These services also include institution and defense of land use litigation. Our mediation practice is focused on clients seeking divorce mediation services and commercial dispute resolution. Our civil litigation usually involves commercial or estate disputes. Call to schedule an initial consultation Get in touch with us today by phone at 609-921-6077 or go online to schedule an initial consultation. Meet us in our easily accessible Princeton office and we can discuss how we can assist you in reaching the outcome you desire. Miller Porter & Muller, P.C. believes you deserve the best representation, and we are here to do just that. Preserving your family's wealth for future generations Whether you're planning the parameters of your future medical care or establishing support for loved ones upon your death, Miller, Porter & Muller, P.C. can help with all aspects of trusts and estates issues, including: Estate planning Estate administration Estate tax issues Choosing the appropriate executor Guardianships Living wills Living trusts Wills drafting Securing your legacy You work hard for your family, so knowing that you have planned for their long-term well-being and financial security can bring you comfort. We thoroughly analyze your estate and strategize the best means of transferring your assets, minimizing taxes, establishing guardianship for your children, caring for your pets, supporting personal philanthropic causes and protecting your loved ones. Drafting your living will and last will and testament A will is essential at every stage of your life. Your living will sets the parameters for medical intervention should you become incapacitated. This assures that when you are most vulnerable, your wishes will be honored. Your last will provides the opportunity to distribute your property, establish care for your children and otherwise express your wishes upon your death. A will is necessary if you intend to leave property to a person or entity other than a blood relative, such as a domestic partner, a friend or a charity. If you die without a will, the court determines how your property is distributed, who cares for your children and even what happens to your pet, making decisions that might not reflect your desires. We can draft valid wills that ensure your intentions are honored. Changing your will As your life changes, so might your estate plan. You may need to update your will throughout your life. Miller, Porter & Muller, P.C. drafts valid codicils that address changes in your financial situation, marital status, number of children, philanthropic interests and general lifestyle decisions. Appointment of guardianship If you have minor children, your will allows you to make decisions about their future care. This is especially crucial if you are a single parent or if both parents die in a common incident. If you do not name a guardian, the court will appoint a guardian for your children and can make decisions adverse to your ultimate parenting goals. You can also make arrangements for your pets' care in your will, including naming a guardian to take responsibility for your pets. Contact an estate planning law firm you can trust, Miller, Porter & Muller, P.C. For estate planning services in Princeton and throughout New Jersey, call Miller, Porter & Muller, P.C. at 609-921-6077 or contact us online to schedule a free initial consultation. Biography: Order of the Coif. Member, Virginia Law Review, 1964-1966. Law Clerk, United States District Court, New Jersey, 1966-1967. Member of Staff, New Jersey Tax Policy Committee, 1970. Counsel: Princeton Planning Board, 1977--; Counsel, Princeton Area Community Foundation, 2005 --.